Our Double Coloured 40mm Snap Frames with black and silver trim clip open for quick change poster replacement. 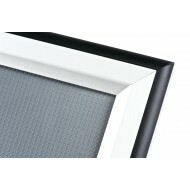 They are manufactured in aluminium with an anti glare PVC cover and a 1.5mm rigid plastic back panel. The outer area is black and the inner area, which clips open is silver. Our twin coloured snap frames are individually boxed and they can be displayed landscape or portrait. They are supplied with fixings which are hidden behind the mounted snap frame. A1 Double Coloured Black and Silver Snap Frame, 40mm, for a poster of 594mm x 841mm. Our A1 D..
A3 Double Coloured Black and Silver Snap Frame, 40mm, for a poster of 420mm x 297mm. Our Dou..
A4 Double Coloured Black and Silver Snap Frame, 40mm, for a poster of 210mm x 297mm. Our A4 Doub..